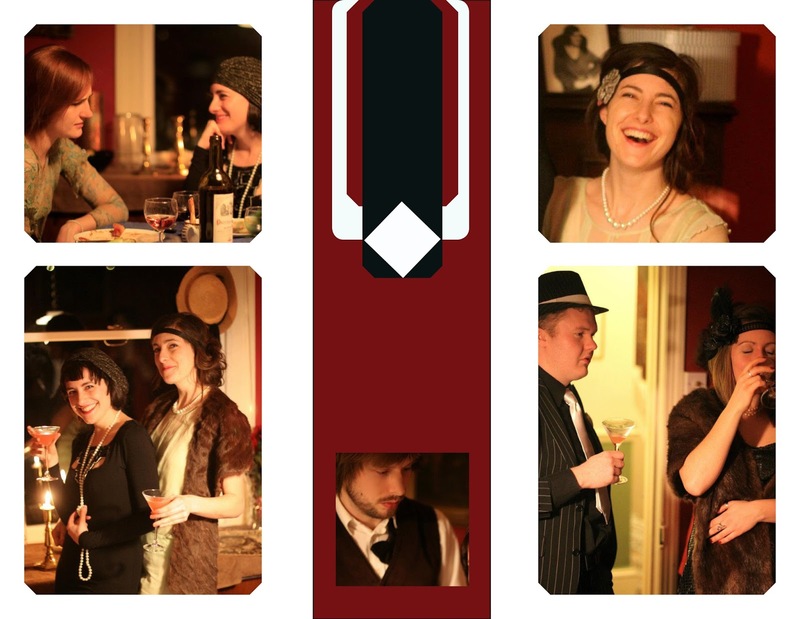 It was my birthday last week and, amongst a myriad of fun things and general over-indulgence, I had a 1920s-themed dinner party. Honestly, it was supposed to be a murder-mystery party, but I failed to organise it in time, so it got downgraded: dinner, costumes and booze, just no corpse. I had a little difficulty designing a 1920s menu. According to my first Google search, the only things they ate in the 1920s were Waldorf salad, baked ham and pineapple upside-down cake. Firstly, this seemed rather unlikely, and secondly, most of my friends are vegetarian and I can't even make cake the right way up. Also, it's not so easy to convey '1920s' in the average modern house. Blog posts I read on the subject called for crisp white table cloths, fine bone china and black place mats, one even suggested strings of pearls hanging around the room! I don't know about you, but I can't really afford to start buying different coloured table cloths, place mats and fine bone china every time I have a themed party. And who really uses place mats anyway? So I ignored all the Internet advice and did it my way, and it was surprisingly easy, cheap and amazingly good fun. Below are my 1920s dinner party tips; I think you should definitely host one! * Don't get too carried away. No-one will love you any the less if you haven't single-handedly made authentic hors d'oeuvres, a trio of deserts and choreographed a tap-dancing routine to 'All That Jazz'. In fact, if you forced them to sit through the latter, they may love you less. * Accept help if it's offered: you deserve to enjoy your party too. My wonderful friends James and Holly provided the cocktails and upside-down cake: I will love them forever. * Vintage suitcases or hatboxes help convey the 1920s theme and make cool storage solutions, so you can get lots of use out of them after the party. You can usually find these at second-hand stores or on Ebay. * Any black-and-white photographs you have knocking around the house help to set the scene; alternatively, you could just print out pictures of 1920s film stars and put them in a few frames. * Anything vintage-looking like glass decanters, straw boater hats, fancy candle sticks or china teacups work really well and can usually be found in charity shops. * Cocktail glasses, a cocktail shaker and someone at least half adept at making them are a must. Even if you have no food, you definitely need cocktails! * Rose petals scattered on the table and flowers in vases are an easy way to make your table look good. * Most importantly, don't forget the music, and start playing it before everyone arrives to get yourself in the mood. You can get downloads to your computer from Amazon pretty cheaply. We had an album called The Romantic Age of the Twenties, which was cool, but ultimately I think something more raucously jazzy would be more fun. * Don't worry too much about making the food accurate, perhaps just throw in a couple of token things. For example, I made an Italian aubergine and Parmesan dish, with a Waldorf salad on the side. I'm not sure if they really went together, but they both tasted nice, so I'm not sure it really mattered. If you'd like some ideas on 1920s fashion and murder mystery games, you can see my earlier post here. To check out my murder-mystery game website click here. Thank you! I can't wait for the Great Gatsby either... currently learning how to create 20s look hair using a pin curl technique, so I'll post on that soon... watch this space!